Friday’s presentation of two SUVs to Nigerian hip pop star, 2face Idibia, and wife, Annie Macaulay, by Akwa Ibom State governor, Godswill Akpabio, at their traditional wedding, has got a lot of Nigerians railing at the profligacy of public officials. Mr. Akpabio had stunned guests that thronged the Apostolic High School, Esit Urua Community venue, along Eket-Ibeno Road, for the traditional wedding of the celerity couple with the announcement of a donation of two brand new Toyota Prado SUVs to them. The lucky couple are also to travel in the luxury of the company of 29 delegates from Akwa Ibom to the United Arab Emirate, UAE, courtesy of the governor, who also promised to throw the state’s treasury open to bankroll an all-expense paid trip for the white wedding scheduled for March 23 in Dubai. The Eket-Ibeno Road, which has remained in a bad state for a long time, is to be fully rehabilitated before the next child dedication ceremony of the couple, the governor said. Although a couple of loyalists commended the governor, commonly derisively called “the uncommon transformer” in the state, for his reckless spending of state funds, a cross-section of other Nigerians have described the gesture as “misplaced priority”, “wasteful” and “abuse of public trust” in the management of state resources. The state Commissioner for Information, Aniekan Umanah, did not respond to calls and text messages by PREMIUM TIMES for official explanation regarding why the governor made the extravagant gesture in a state where salaries to civil servants are known to be consistently irregular. A supporter of the governor, Egondu Okorie, was excited about the governor’s gesture, expressing disappointment in his Facebook page at those he said were making “shallow minded comments”, which he noted would not happen in civilized societies. Another supporter, Ikazoboh Victor, blamed poverty for the comments by some of the governor’s critics, who condemned the donation, saying that “there is no big deal about just two SUVs as wedding gift”. But not everybody is impressed, with some describing the gifts as outrageous. For Obo Effanga, Governance Manager, Action Aid Nigeria, the governor’s action is embarrassing, as it defeats the purpose for good governance, particularly in the allocation of resources. “This is very embarrassing indeed! If governance is about being in a position to take decisions in the interest of the people of the state, when a governor allocates public resources to individuals because of their closeness to him, how does this enhance that purpose and the interest of the ordinary citizens in the state, on whose behalf the governor claimed he was making the donation?,” Mr Effanga said. “It is even awkward that he donated two different cars to the couple, who, by virtue of their wedding, are supposed to be one in line with the marriage principle. He could as well have donated two different houses to them, as if he wants them to live separately! “If the governor was doing this with his personal resources, which is very doubtful, nobody would be complaining. As if that is not enough, the state is going to bear the cost of 29 officials travelling to Dubai for the wedding. “This amount could have been enough to do something more useful to the society. It could buy several volumes of books for University of Uyo that has been crying of funding challenges. That amount could sponsor a lot drugs that could be dispensed to citizens free,” he added. Spokesman for the Congress for Progressive Change, CPC, Rotimi Fashakin, said it is such profligate and reckless spending of available resources at their disposal by governors from the Niger Delta region that has made the Petroleum Industry Bill, PIB, to suffer a long delay at the National Assembly till today. According to Mr. Fashakin, if it were his personal resources, Mr. Akpabio would not do what he did, but having realised that Akwa Ibom earns a lot, based on 13 percent derivation, he could afford to spend on anything that catches his fancies. For Tope Fasua, an Abuja-based public affairs commentator, such behaviours are clearly as a result of lack of vision by our leaders. “The Bible says the people perish for lack of vision and knowledge. Akpabio lacks vision, because he is on an ego trip. He thinks he has arrived. But, the truth is that despite the huge oil money that goes to the state every month, the rate of poverty still affects 80 per cent of the population. A return ticket, Lagos-Dubai-Lagos, on Emirates flight is about $806 (about N126,542.00) for one person; and when multiplied by at least 35 people, made up of the 29 delegates, the couple and their parents, or representatives, the total cost for tickets and other protocol arrangements, like visa application fees, would be about N5million. It is not clear if the governor would prefer a chartered flight arrangement or the use of his private jet to guarantee executive comfort for the delegation. To take care of the transport and accommodation of the delegation, it is not also clear if the protocol arrangement would opt for an Executive Limousine option and a top of the range hospitality arrangement befitting the status of a pop star by going for a $2,000 per room per night lodging in a five-star hotel, which might cost about $300,000 (about N47 million) for at least a four-day stay. Other exigencies, including at least $3,000 for each delegate as estacode ($105,000), about N16.5million, and other bookings for the wedding proper and reception, would gulp about N10million. Conservative estimates show that by the time the couple returns to Nigeria at the end of the trip to Dubai, a minimum of N100million, including the cost of the two SUVs, would have gone from the state treasury for the project. For Mr. Effanga, a donation of N100million to the University of Uyo would have gone a long way in relieving the university l of its funding constraint, which Vice Chancellor Comfort Ekpo, told the visiting Senate Committee on Education last week is affecting the development of the institution. “If the amount to be spent on the ego trip to Dubai were to be invested in the provision of books to school libraries, medical facilities in hospitals or boreholes to communities in the state, including the musician’s new wife’s village, many citizens would derive more utilitarian value from the expenditure,” the activist noted. victor ikazoboh must be one of those picking up crumbs from the governors table for him to label critics of this shameless and reckless spending of public fund on couples that are self sufficient.Victor read your bible please.I the Lord giveth knowledge with which to make wealth.Who are you to say someone is poor you unfortunate thing. 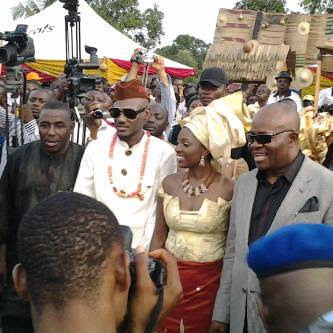 No thinkam ur miracle is on the way happy wedlock 2face. Misplaced priority indeed. Why is EFCC now? They should investigate this man’s source of income and he better not say the gifts were paid from the state fund. this nonsense and abuse of power,the money that surpose to use for helping the poor citized is be giving to guy that already made.well,in nigeria the poor getting poorer,why the rich getting richer.i dont blame the governor the money do not belong to he is a state money. Na wao why all this is happen.2face is ok, why spending like that why some people are not yet collect salary for months,na wao. well. when a state is run by those who has nothing in come with the poeple of the state, they use public funds to make friendship n stupid donations. first he gave 50 million to NOLLYWOOD now 2 SUV. When will this kind of investment yield good results? So it is after all true that the bible said that he who has small even the smaller one that he has will be collected and be added to the one who has much. 2face is already in money, why not take the worth of these SUVs in cash and share it to the needies? or better still, go to the hospitals and try settle some peoples medical bills. This is absurdity and misplacement of public fund. Rumor mongers say what you know. As a matter of fact he says above minimum wage and timely. Always be sure of what you say, try visit the state before writing. Can you prove that the fund is coming from state purse. Go tell fashola to stop collecting toll gate from people. There are better roads in this country but they a not paying to take the roads. Why pay in lagos. U guys should condemn the real issue not a governor that is doing so well and the whole world is seeing it. The governor is mad and where is so call EFCC,Been a governor does not means you are not accountable to state fund.I don’t know what they are turning the country to i mean Nigeria.When will these madness End? Well i don’t blame de governor because power entoxicate… 2face is busy buying de whole of Lagos and Abuja and u re here spending on a guy who is richer than you(4get say u be governor),who earn more than 50 million in two wks! Invest on ur people plz. The Governor is insane and he would be corrected by EFCC very soon or later. @ Amaka, no body is saying Akpabio is not doing well, infact he is best 4 now, but have u checked d number of Akwa ibomites nation wide, doing minor jobs & the CEO of their state is spending on people that have made it in life. what is the relationship between Akwa ibom state government with 2face & wife, whats the economic input of the donations? my people has this saying, & i quote: those that the gods wants to kill they first of all make them mad. Wot a country! Indeed d rich becum richer and d poor poorer. GOD help us. When you elect idiots, this is what you get. Dummy Federal Government gives allocation to states and desires no accountability for each naira spent. Governors whose forefathers have not seen such money before treats allocation like money in his personal account.. Same goes for all sector of this “backward acting” nation, no accountability, just send out EFCC after years have been wasted. And this is the nation that desires nuclear power plants, I am very sorry for the masses if they allow this to happen. Those that praise Akpabio for doing a lots in his state should better watch what they are saying, because his so-called achievement does not cut across all the state. It is a thing of selected areas, mainly, areas of his people or choice. E.g, my local government Mkpat Enin LGA has no good road and other infrastructures. The man – Akpabio should continue to do whatever is likes with the state funds, but should remember that 2015 is coming and he will be out of office and will be picked by EFCC. Everybody is Greedy,even the state governor,fedral governor?so who are you to blame.buying suv’s and an undisclosed sum of money in the name of dubai and 2face white wedding?is highly stupid.well akwa ibomites na so dem be..Very soon nuclear weapons would be dispatched and such states woud be terrorised. Sheer reckless spending by dy Gov. Totaly absurd! Yes, he has done wel in dy state bt #100m can add reasonable value 2 dy lives of Akwa ibomites! Am disappointed in akpabio. It does show hw accountable our leaders are! When will these nonsense stop. Absolute rubish. So †ђξ Governor has not seen thoe wedding without home, walking without car and those hungary & needy without hope of tomorrow to give gift or money instead of giving Tuface & wife that already have more than enough! former nackmates …………….. sign-off fees……………..